Years ago I bought a copy of The Atlas of Middle-Earth, Karen Wynn Fonstad's classic and exhaustively-researched tome dedicated to the geography of J.R.R. Tolkien's legendarium. More than a decade and a half later it remains one of the favorite pieces of my fantasy/science fiction library. And almost immediately afterward I began thinking that the Star Wars saga needed some cartographic love too. There have been a number of attempts - both official and fan-driven - over the years to accomplish such a task, and now Daniel Wallace and Jason Fry have produced what is by far the definitive volume of maps from that galaxy far, far away. Star Wars: The Essential Atlas (LucasBooks) is a whopping 256 pages packed with full-color maps, illustrations, diagrams and loads of fluff from the entire thirty-plus decades of Star Wars storytelling. I bought my copy a few days ago and since then I've spent quite a bit of time enjoying the overwhelming sense of place and history that Wallace and Fry have captured and conveyed from George Lucas' beloved space opera. All the eras that have been chronicled so far of Star Wars lore are covered: from the pre-Republic days and the founding of the Jedi Order, to the tumultuous millennia wracked by the Sith, on through the fall of the Republic and the rise of the Empire... and beyond. I caught a few minor errors in the book, but nothing substantially wrong. But then, I can only imagine that the biggest of Star Wars geeks (like me :-) would have caught them, they're so tiny. Indeed: a work as grand in scope as Star Wars: The Essential Atlas would normally contain many more and even bigger mistakes. As it is, the book stands tall as both a testament to Wallace and Fry's outstanding work, and the spirit of both Star Wars and its devotees in general. There seems to be a good upswing lately so far as Star Wars literature goes. 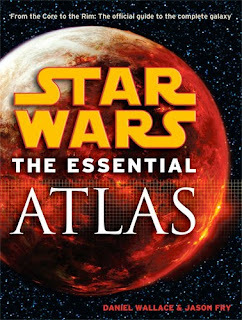 Star Wars: The Essential Atlas is certainly one of its finest, and well worth investing some coin toward if you're at all a fan of the saga. It definitely should not be missed from your Star Wars bookshelf.